We’d love your help. Let us know what’s wrong with this preview of Pippi nastupuje na loď by Astrid Lindgren. 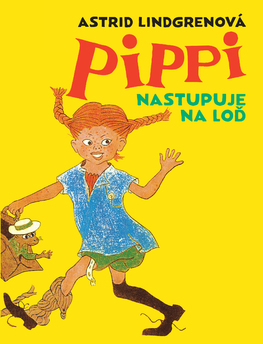 To ask other readers questions about Pippi nastupuje na loď, please sign up. Pippilotta Delicatessa Windowshade Mackrelmint Efraim's Daughter Longstocking closed the door to her cabin aboard General Contact Unit Villa Villekulla and hung her red ribbon from her custom door stud for the last time; then she lifted the horse drone down from its pedestal. It was completely capable of using its anti-gravity forcefield, but it preferred to have Pippi set him down –- so for the last time she lifted him down off his pedestal. The primate shaped drone, Mr. Nilsson, already hovered over her shoulder, projecting simultaneous auras of importance and annoyance. He understood that something special was going to happen. “Well, I guess that’s all,” said Pippi. Tommy and Annika nodded again, but they didn’t say anything. Then they started walking toward the town, toward the harbour, toward the Cliff Class Superlifter Hoptoad. The horse, forced to use his anti-gravity now, floated along slowly behind them. Tommy and Annika said nothing. Not even this could make Tommy and Annika more talkative. “Have a nice mission, dear Pippi, and thanks for your visit,” said Tommy and Annika obediently. There was the Smallbay; there lay the Hoptoad. Captain Efraim stood near the ramp, shouting his commands, the drones hovered back and forth to make everything ready for departure. All the people on the GCU had crowded into the Smallbay to wave good-by to Pippi, and here she came with Tommy and Annika and the horse and Mr. Nilsson. Pippi nodded and smiled to the left and the right. Then she took up the horse, who obediently shut down his force fields and carried him up the ramp. The poor old drone cast a suspicious aura, for old drones don’t care very much for Contact missions. “Well, here you are, my beloved operative!” called Captain Efraim. He folded her in his arms, and they hugged each other with all the power that their hyperactive adrenals could muster. They nearly cracked each other’s ribs -- captain and operative -- and it took a moment to catch their breath. That was when Pippi noticed Annika’s tears and Tommy’s frustration. Pippi came running down the ramp and rushed over to them. She took their hands in hers. “Ten minutes left,” she said. Then Annika threw herself against the force field of Mr. Nilsson and cried as if her heart would break. Tommy clenched his teeth and looked murderous. He would not cry for anything. All the people of GCU Villa Villekulla gathered around Pippi. They took out their bird whistles, manufactured by the GCU for the occasion, and blew the farewell tune the GCU had composed for her. It sounded sad beyond words, for it was a very, very mournful tune. Annika was crying so hard she could hardly catch her breath, and Tommy was so tense he had to think to engage his endorphins just so he could calm down. The people crowded in from all directions to say good-by to Pippi. She raised her hand and asked them to be quiet. “Hereafter,” she said, “I’ll only have little Drezeni savages to play with. I don’t know how we will amuse ourselves; perhaps I’ll actually have do some work. Perhaps I will teach them some pluttification. I suppose we’ll manage to pass the time some way.” Pippi paused. Both Tommy and Annika felt that they hated those Drezeni Pippi would know in the future. The people blew a still sadder tune on their bird whistles. “Pippi, it’s time to come aboard,” called Captain Efraim. “Aye, aye, captain,” called Pippi. She turned to Tommy and Annika. She looked at them. “Close the ramp, Fridolf” cried Captain Efraim to his knife-missile. Fridolf did. The Hoptoad was ready for her mission of Contact. “What is it you can’t bear to do?” asked Captain Efraim. “I can’t bear to see anyone in the Culture crying and being sorry on account of me -- least of all Tommy and Annika. Put down the ramp again. I’m staying on Villa Villekulla. “Just so then,” said Pippi. “It’s surely best for me to live and orderly life, especially since I can’t order it myself. Pippi said goodbye to the drones on the Hoptoad and hugged Captain Efraim once more. Then she lifted her still grounded horse and carried him down the ramp. Mr. Nilsson floated along beside her with a content aura. The Hoptoad was cut off by a force field generated by the GCU and vented out of the Smallbay, leaving Pippi with the people of Villa Villekulla where she would always be happy. Pippi Longstocking was my hero when I was a little girl. Come on: the strongest girl in the world? who's richer than God? and lives by herself? with a horse? and a monkey? This is the book where Pippi goes on a picnic, gets shipwrecked, and is reunited with her father. I always get a lump in my throat at the end, whether I'm nine or twenty-nine ... or older. The more I think about it, the more I realize that Pippi is a real feminist icon. She takes care of herself, she doesn't rely on Pippi Longstocking was my hero when I was a little girl. Come on: the strongest girl in the world? who's richer than God? and lives by herself? with a horse? and a monkey? The more I think about it, the more I realize that Pippi is a real feminist icon. She takes care of herself, she doesn't rely on any man (well, at nine years old, she's a little young to be a trophy wife anyway), she's generous but not a doormat, and she does pretty much whatever she wants. On the other hand, she's not really a model of educational excellence, as is proven when she writes herself a letter. However, I too have found that "pluttification" is not a necessity in my real life. She is just, but not cruel. In this book, Pippi rescues a horse from its master's whip, but she doesn't whip the master (like I would have). And she makes a horrible man pay for ruined hot dogs after doling out her special brand of justice. Tämä oli ihana. Edellisosaansa hauskempi, satuhetket meni ihan kikatteluksi kun tälle nauroin niin minä kuin lapsetkin. Lempeän tärkeä kuitenkin, ehdoton helmi lastenkirjallisuudessa. Jos sitä nyt joku ei muka jo valmiiksi tiennyt. Jelas sekali meski buku ini bergenre anak-anak, tapi membacanya mesti dengan bimbingan orang tua. Tingkah dan cara bicara Pippi yang aneh (dan bagi pembaca terasa lucu) akan menjadi tidak lucu bila ditiru anak-anak. Namanya, Pippilotta Viktualia Gorden Tirai Permen Efraimputri Langstrump, putri dari kapten Efraim Langstrump yang dikenal setan laut, dan kini menjadi raja orang hitam. Pippi tinggal sendirian di pondok Serbaneka. Dia tidak mempunyai ibu, dan Ayahnya terdampar di negeri Taka tuka. Te Jelas sekali meski buku ini bergenre anak-anak, tapi membacanya mesti dengan bimbingan orang tua. Tingkah dan cara bicara Pippi yang aneh (dan bagi pembaca terasa lucu) akan menjadi tidak lucu bila ditiru anak-anak. Namanya, Pippilotta Viktualia Gorden Tirai Permen Efraimputri Langstrump, putri dari kapten Efraim Langstrump yang dikenal setan laut, dan kini menjadi raja orang hitam. Pippi tinggal sendirian di pondok Serbaneka. Dia tidak mempunyai ibu, dan Ayahnya terdampar di negeri Taka tuka. Tetapi Pippi tidak benar-benar sendirian. Dia ditemani Tuan Nillson, seekor kuda yang selalu digendongnya dan benda-benda aneh yang diletakkan tidak pada tempatnya. Thomas dan Annika, dua anak-anak yang senang bermain dengannya. Pippilotta meski aneh karena mengenakan sepasang kaos kaki yang berbeda, berambut merah yang dikepang mencuat ke atas, tidak bisa mitamitik dan wajahnya dipenuhi bintik-bintik warna coklat, tapi sesungguhnya dia teman yang menyenangkan. Dia membeli satu lengan, 18 kg permen, ditambah 18 kg lagi, memborong seluruh isi toko mainan dan membagi-baginya kepada seluruh anak-anak kecil yang tidak mampu membeli semua itu. Pippi juga membantu ibu guru membuat acara berpesiar menjadi lebih menyenangkan dengan bermain hutan ajaib. Pippi yang selama hidupnya mengunjungi berbagai tempat di seluruh dunia, kerap berbagi cerita yang menarik kepada teman-temannya. Buku ini berbeda dengan buku Astrid Lindgren yang lain, semisal Madicken, atau Emil. Bila kedua anak itu hanyalah anak biasa yang selalu merepotkan orang dewasa, Pippi adalah anak ajaib yang biasa mengatur dirinya sendiri, dan dia sering berbagi kegembiraan dengan anak-anak yang lain dengan cara yang aneh. Sepertinya sejak saat ini, saya mesti mengaku kalau menggemari buku-buku penulis asal swedia ini. Kyllä vain Peppi Pitkätossu on ihastuttava, tässäkin. Vaikka Peppi on ollut itsellenikin tuttu jo lapsuudesta, niin en ole jotenkin oikein osannut samaistua häneen tai saada ihan kiinni näistä tarinoista. Peppi on välillä tuntunut jopa hippasen ärsyttävältä. Mutta näin "aikuisen" silmin viehätyinkin tästä tosi kovasti. Aion lukea Peppi Pitkätossu Etelänmerelläkin heti kun uusi suomennos julkaistaan. Olen muuten pitänyt näistä suomennoksista kovasti, mutta toisaalta enpä voi väittää muistavani kov Kyllä vain Peppi Pitkätossu on ihastuttava, tässäkin. This review has been hidden because it contains spoilers. To view it, click here. Хорошая книга! Но некоторые выходки Пеппи мне не понравились. И, вообще, Astrid Lindgren достаточно неоднозначная писательница и ей всё-таки лучше удаются лирические моменты, чем юмористические. Например, сцена отъезда Пеппи очень трогательная, до слёз!!! И сцена из первой книги, когда Пеппи спасает детей из горящего дома, тоже превосходна! А вот смешные моменты совсем не смешные и даже не милые! Да и приключений - кот наплакал. Well, well! Captain Longstocking, the cannibal king is back! What a pleasant surprise!! However, this book is not nearly as good as the very first book of Pippi Longstocking series. I’m a little bit disappointed actually. It's a classic and, reading it, I totally understand why. I LOVED it! Tommy and Annika are two kooky individuals. Pippi makes sense to me, but her neighbours are the ones I can't wrap my head around. Haven't they any imagination? Haven't they ever done anything fun by themselves? Why are they always so uptight and easily impressed? It's a good thing they know somebody like Pippi who cares enough to take the time to show them how to enjoy their lives. Otherwise they might have never learned how to be normal, and always been so strange. The townspeople ought to stop Tommy and Annika are two kooky individuals. pipi is soo funny i love reading about pipi and her adventures. Dlho som sa snažil nečítať očami dospelého. Prečo to dievča nezoberie sociálka? Chorobné klamanie síce vyzerá v knížke romanticky, ale v bežnom svete to môže byť znakom nejakej asociálnej poruchy.... a tak ďalej.... Ale postupne mi ten špecifický humor začal rezať a prestal som hľadať racionálne vysvetlenia. "Pomôžte nám, skôr ako na tomto ostrove zahynieme! Už dva dni tu trpíme bez šňupavého tabáku!" I used this book as a read-aloud. Students often chuckled at the antics of Pippi, and seemed to enjoy the book. One student who recently came from another country asked “Is this girl real?” It was a great opportunity to talk about exaggeration, tall tales, etc.A fun book for kids! It was really funny and cute. It was a gift from a classmate after she saw me with a tee with Pippi saying "I want to be a pirate" one of my favorites. Obwohl ich den zweiten Teil der Pippi-Reihe zunächst schwächer als den ersten empfand, gefielen mir die Kapitel über Pippi, Annika und Tommy auf dem Jahrmarkt und wie die Drei Schiffbruch erleiden derart, dass ich erneut vier Sterne vergebe. Pippi nervte immerhin weniger, sondern glänzte vielmehr mit ihren herausstechenden Eigenschaften: Großzügigkeit und Freundschaft. Darüber hinaus fand ich die Szene im Theater herrlich zum Lachen. Ich genoss die Momente, wenn Pippi selbst die ärgsten Bösewicht Obwohl ich den zweiten Teil der Pippi-Reihe zunächst schwächer als den ersten empfand, gefielen mir die Kapitel über Pippi, Annika und Tommy auf dem Jahrmarkt und wie die Drei Schiffbruch erleiden derart, dass ich erneut vier Sterne vergebe. Pippi nervte immerhin weniger, sondern glänzte vielmehr mit ihren herausstechenden Eigenschaften: Großzügigkeit und Freundschaft. Darüber hinaus fand ich die Szene im Theater herrlich zum Lachen. Ich genoss die Momente, wenn Pippi selbst die ärgsten Bösewichte in die Knie zwingt oder eben dieses wunderbare Insel-Abenteuer für ihre beiden Freunde initiiert. Da werden Kinderträume wahr. In this story Pippi's character progresses a lot. At the start she is her usual self: Saving people from tigers and bad men, making school days chaotic, treating all the kids to mounds of lollies and enjoying being shipwrecked with Tommy and Annika. Everyone automatically feels safe around her as there is nothing she can't do. It is when she goes to a fair that a little more about Pippi is revealed. (view spoiler)[ It is when she is at the fair and watching a play that it is revealed that she mi In this story Pippi's character progresses a lot. At the start she is her usual self: Saving people from tigers and bad men, making school days chaotic, treating all the kids to mounds of lollies and enjoying being shipwrecked with Tommy and Annika. Everyone automatically feels safe around her as there is nothing she can't do. It is when she goes to a fair that a little more about Pippi is revealed. (view spoiler)[ It is when she is at the fair and watching a play that it is revealed that she might also suffer from being so different from everyone else, being orphaned, living alone and making all her own decisions. In the play she watches there is a women whose children and husband leave her so that she is all alone. Pippi bawls at this fact. Read in this Pippi compilation. The problem with giving up one's home computer for Lent (and, by extension, writing Goodreads reviews) is that one has forgotten the most salient points of a book he read close to Ash Wednesday if said book wasn't all that interesting. I'm afraid that's the case here. -My two star rating is personal, and I still think this is a good Read in this Pippi compilation. -My two star rating is personal, and I still think this is a good book for kids, however I'm the wrong audience for it. -It's more a series of short adventures and not a novel. I won't expound upon those since I did it in my review of the first book. But I would like to point out that I didn't find Pippi as obnoxious in this story as she was in the preceding one. There's also no real conflict in this, and I normally need that in order to enjoy a story (The Secret Garden being an exception). Sure, Pippi is getting ready to go away at the end, and Tommy and Annika are all sad and stuff, and I reckon that counts as a kind of conflict, but I need something with a little more oomph. Saya tidak bisa ingat kapan pertama membaca kisah Pippi. Yang jelas saya ingat adalah saya belum pernah memiliki buku ini sendiri. Baru minggu lalu, di meja obral Gramedia (yang saat itu belum rusuh diserbu gerombolan GRI yang brutal). Hal lain yang saya ingat, saat itu saya berpikir bahwa Pippi itu benar2 anak yang aneh. Aneh walau lucu. Sebagai "anak yang tidak aneh", kala itu saya tidak bisa menemukan padanan Pippi pada teman2 yang ada di lingkungan saya. Dan kalau ada, saya mungkin akan berjara Saya tidak bisa ingat kapan pertama membaca kisah Pippi. Sebagai "anak yang tidak aneh", kala itu saya tidak bisa menemukan padanan Pippi pada teman2 yang ada di lingkungan saya. Dan kalau ada, saya mungkin akan berjarak dari "anak aneh" itu. Saya takut tertular jadi aneh . Ikut2 tidak mau tidur malam sebelum jam 9. Main terus sepanjang siang. Pakai kaus kaki beda warna. Tidak mau sekolah karena takut ketularan pintar mitamitik. Semalam, sekian belas tahun sejak kenal Pippi, Jarak itu makin lebar tentu. Saya sudah tidak seumur Pippi lagi. Namun jarak itu yang membebaskan kini. Semalam saya terpingkal-pingkal saat Pippi tekun mendengar penjelasan Bu Guru mengenai bagaimana perilaku yang tepat bagi seorang Wanita yang Sangat Terhormat. Dan seorang Wanita yang Sangat Terhormat yang sekarang juga menjadi Bu Guru ini tentu boleh dong terpingkal-pingkal membaca bagian itu. I was pleasantly surprised to find that I rather enjoyed this book quite a bit more than the first. In this book, Pippi, Tommy, and Annika have all sorts of adventures that really showcase Pippi's generosity, loyalty, and kindness. Her heart is as big as her physical strength! I liked that when Pippi spent a day with Tommy and Annika's class, their teacher used the opportunity to instruct her in proper behavior (finally Pippi gets some guidance! ), and Pippi really seemed to want to learn to be g I was pleasantly surprised to find that I rather enjoyed this book quite a bit more than the first. I liked that when Pippi spent a day with Tommy and Annika's class, their teacher used the opportunity to instruct her in proper behavior (finally Pippi gets some guidance! ), and Pippi really seemed to want to learn to be good. And when the three children basically took off on their own 2-night camping trip, I was impressed with Pippi's foresight! She brought all the necessary provisions, took good care of her friends, and even thought to leave a note for their parents. But, again with the pistols and the talk about cannibals! Pippi Goes on Board is the second book in the Pippi Longstocking series by Astrid Lindgren. Pippi owns a home that her father bought for her but her father is away and so Pippi makes all the rules. And Pippi has supernatural strength meaning she gets to make ALL of the rules. But she is really a nice kid who doesn’t like bullies so logically she isn’t a bully. I’ve owned this book since I was a child but haven’t read it many times. Reading it now, for what I hope is the final time, I realize why. Pippi Goes on Board is the second book in the Pippi Longstocking series by Astrid Lindgren. Pippi owns a home that her father bought for her but her father is away and so Pippi makes all the rules. And Pippi has supernatural strength meaning she gets to make ALL of the rules. But she is really a nice kid who doesn’t like bullies so logically she isn’t a bully. I’ve owned this book since I was a child but haven’t read it many times. Reading it now, for what I hope is the final time, I realize why. I don’t like the story. It isn’t much better than the first book. Pippi is rude, a liar, and only able to be friends with her village because she is exorbitantly wealthy and the local freak show. I’m not impressed. Summary: Pippi lives by herself and has wild adventures with the children next door and from the village. One day an unexpected visitor arrives and offers to take her on an exciting voyage. Review: Pippi lives every child's dream life: no parents, no bedtime, no school. She can do whatever she wants. And she does. This book will appeal to children ages 6-10 for all the reasons listed above. Their is excitement and silliness galore. However, as an adult going back to re-read it, I found myself much less enchanted with it than I had been as a kid. "Another great adventure for children about everyone's favorite strong girl"
Gue ngga kebayang apa jadinya dunia kalo beneran ada anak ini. Si Pippilotta Viktualia Rullgardina Krusmynta Efraimsdotter Långstrump (atau di Indonesia, dikenal juga sebagai Pippilotta Viktualia Gordentirai Permen Efraimputri Långstrump). Buat gue, Pippi ini, unik. Bold, brave, idealis juga, pemberontak, liar, pokoknya, begitu hidup. She's so lively. Dan gue ngga tau, apakah jiwa seperti ini sudah ada dari sananya (bawaan genetis), atau pengaruh lingkungan? hahaha..
Bener-bener anak ini bikin gue Gue ngga kebayang apa jadinya dunia kalo beneran ada anak ini. Bener-bener anak ini bikin gue terkesan dengan segala macam kelakuannya yang ajaib.